When Edelman PR expanded its world headquarters from Times Square to Hudson Square they wanted to make sure that the new office lobby spoke of growth and cutting edge technology. Installing a 6’ x 9’ HP touchscreen ‘wall’ that updated with current news cycles was not enough. 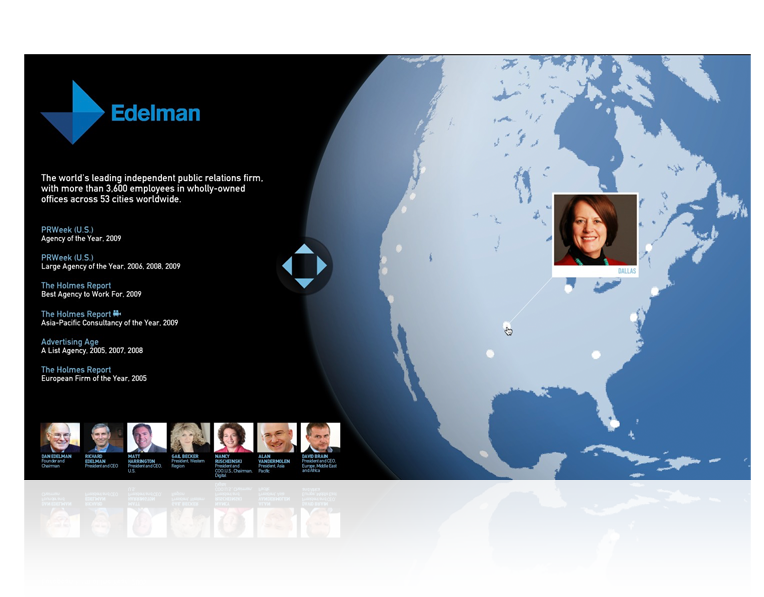 They engaged MLCreative to produce and create a series of touch-smart applications, the most compelling of which involved an enormous, interactive, spinnable, 3D globe, displaying the Edelman headquarters in every country around the world, and, on further user interaction, that played a video of the President of that region listing his office accolades and accomplishments.